Fourteen episodes later, in “Finally! Part 1,” Rebecca gleefully recounted her previous, real night of sexual bliss with the extremely wealthy and already proven to be duplicitous Robin Colcord. Robin managed to make a radio station that he owned play “You Lost That Lovin’ Feeling” all night long. Now that is an excellent callback, even more impressive if your memory recalls Carla’s insistence that some dreams can predict the future. To avoid spoilers I never looked up if it was intentional (I tried and got spoiled with something else entirely, so I don’t do it *anymore*), but if I were to take a guess I would give the writers the benefit of the doubt, considering the technical proficiency of this season. This was the year that Ted Danson finally won a Best Actor in a Comedy Series Emmy, and the year that his character had a clear focus that wasn’t about bedding any specific woman, or multitudes of women. 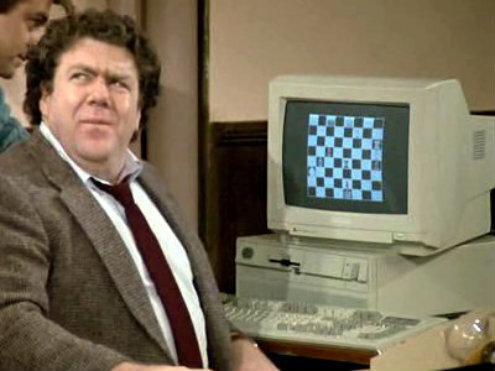 Sam had set his sights set on buying Cheers back from The Lillian Corporation, which he ultimately succeeded in doing after ratting out Robin Colcord for obtaining insider information (from Rebecca’s computer) to takeover the company. The price was one dollar, which is exactly the prize Sam received from Colcord a few episodes earlier for beating him in chess (he cheated.) I would also like to believe that that was also intentional. What was certainly intentional was the joyful chanting by the whole bar of “Sammy’s got the bar back!” as almost two dozen people carried and followed Sam around the room, one of the series’ greatest moments. It was well-earned, even though all that move does is put Rebecca briefly out of work. I too felt like carrying Sam around that bar, still happy about those two possibly planned ironies existing like the nerd that I am. Of course, it had to both be about money – Cheers spends an awful amount of time showing the ways in which wealth can turn people into jerks. Going all the way back towards the beginning with Coach’s fiance of two minutes winning the lottery and forgetting who Coach was, to Carla trying desperately to hide the fact from Eddie’s other widow that she received $50,000 from Eddie’s insurance (we’ll get to that in a bit), to all of the powerful superiors Rebecca looks up to and always gets rejected by, money seems to be the root of all evil. And Robin Colcord was the physical embodiment of all of the things Cheers detested about wealthy people. Robin was never as blatantly blackhearted as C. Montgomery Burns, but I wonder if the rich, evil character Colcord that wrecked havoc and caused some intriguing and humorous plotlines had inspired the first season of The Simpsons somewhat, which premiered halfway through this Cheers season and introduced Mr. Burns to the world. The big comedic highlight for me was the continued sketching in of the world of Hanover, Indiana, Woody Boyd’s hometown. We thankfully never see Hanover, because based on Woody’s stories, it is a place of nightmares. This season we learned that a Hanover sunrise is the sun separating like the big ball used to do at the start of Jeopardy!, thanks to a chemical plant near the landfill. Many citizens are missing a body part due to some accident. One Boyd died by being buried by potatoes. This Indiana town has devolved into lunacy over time, but it’s so over-the-top that it works, something I believe that the quickly canceled Fox sitcom Woops!, a show about a post-apocalyptic community, attempted to convey. Meanwhile the Woodman – whose middle name is apparently Tiberius, just like one James T. Kirk – has evolved even more than last year into more of a human being with emotions, at times admitting to anger. Kelly Gaines, Woody’s rich girlfriend, has turned into a surprisingly fun character that pops up three times a year, possibly to illustrate that not every single wealthy person is bad. A comedic highlight was when Kelly walked in on Woody and guest star Lisa Kudrow making out while rehearsing for a play that Woody had not told Kelly about. After Woody gave the standard “it’s not what you think” line, Kelly angrily concluded exactly what was really going on and stormed off. It was so perfectly unexpected and true to her character. For all of the affection I have for clever writing and rewards for looking for continuity, there are just some things that are funny because they are funny, no matter how banal the story. Frasier’s response to his wife Lilith’s book on the difference between good boys and bad boys was very silly and predictable – he decided to become a bad boy. The ways Frasier initially attempted to break bad was really funny though, especially when Kelsey Grammer ran around the bar with scissors in hand, loudly narrating what he was doing. Grammer and the writers were unafraid to let Frasier fly off the handle once in a while, knowing that any thought of this man possibly being insane himself wont at this point matter because the viewers have accepted him into their homes (no more being called a “pindick.”) Frasier’s drunken, mawkish blubbering that he loves Sam and Dave, the moose head that had just reappeared with the old management back in place is just something Grammer nails, and not anything that can truly be dissected without killing the frog. This season also brought us the classic Cliff Clavin on Jeopardy! episode. I expected more scenes to stem from the actual game, but after the introductions and the funny opening round categories that seem catered to our favorite mail carrier, we joined in for the final round that Cliff of course loses, thanks to needlessly gambling all of his money on the question (or answer.) That is the only way it could have gone – Cliff does possess enough knowledge to net $22,000 heading into Final Jeopardy before they doubled the money values, and would have let himself build enough bravado in that time to bet it all when he had the game already won. Clavin will never get the respect he thinks he deserves, and I have grown to live with that, since he has seemingly stopped caring about changing his ways. Of course, all of his negative qualities might exist so we don’t feel too badly about his very pathetic moments. In order to ensure that Cliff and Maggie, the female mail carrier from last year that took a job in Canada, don’t ultimately get together and live happily ever after, Cliff suddenly developed hysterical blindness whenever she was in the room, something he suddenly had the last time things got too serious with a woman (he did not have this problem before he almost lost his virginity years earlier to the woman who tricked him into signing a release.) But then Clavin will enter the beard growing contest with a suddenly thick beard, which he acquired by supergluing hair to his face, and you just shake your head and go along with it. Norm’s alcoholism is similar. Not unlike Joey Tribbiani’s unhealthy obsession with food in the later years of Friends, Norm Peterson’s love of beer has become the number one source of jokes. He sunk to a new low this season, drinking from a beer can at a funeral (to be fair, he did the same at the opera during the Diane years), trying to drink beer from the bar counter, and insisting on a straw so he can drink his beer during a brief séance when his hands were otherwise occupied. Norm’s painting business seemed to be doing a little better, and some more jokes about not liking Vera were had (Frasier makes similar jokes about Lilith that always sound a lot meaner, probably because we’ve seen Lilith many times), but all that’s really remembered is his love of the booze. Norm’s love of beer will probably live on forever, but Guy “Eddie” LeBec wont. Carla’s husband was killed off early in season eight, saving guest star Thomas Haden Church’s life by pushing him out of the way of an oncoming zamboni. Eddie was killed because apparently if you are an actor and you say that you find kissing your fictional wife is disgusting on a radio show, that actress might hear it and get you fired. In order to make sure Eddie wasn’t entirely missed, it turned out that he was married to someone else, leading to a big confrontation during the funeral, a big set piece that was unusual but made sense with the story (which Norm watched while drinking.) She’ll be fine financially with the insurance check, but almost didn’t keep her pact with the other widow to split everything down the middle until her guilt, physically manifesting in constant shaking, made her reveal the truth. With the exception of Rebecca, all of the characters on Cheers are faced with moral dilemmas once or twice a season, and end up in some way or another making the “right” decision. Rebecca isn’t a “bad” person, but was too enthralled with romance and wicked wealthiness that she needed Sam to make the morally right decision for her. Money is evil, but the folks at Cheers aren’t.